It's the northernmost region of Central Italy: its capital is Florence, which is located almost 300 kilometres from the national capital, Rome. Tuscany is known for its landscapes and its artistic legacy. Six Tuscan localities have been made UNESCO protected sites: the historical center of Florence (1982), the historical center of Siena (1995), the square of the Cathedral of Pisa (1987), the historical center of San Gimignano (1990), the historical center of Pienza (1996) and the Val d'Orcia (2004). The territory is two thirds hilly and one fourth mountainous. 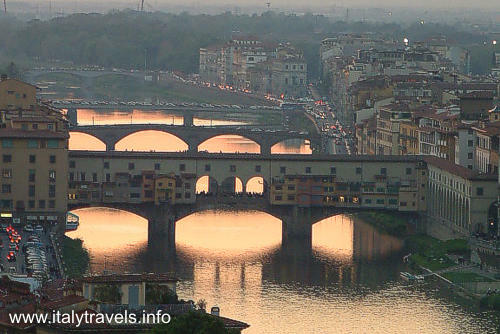 The remainder is constituted by plains, that form the valley of the Arno River. Tuscany is divided into ten provinces: Arezzo, Florence (Firenze), Grosseto, Livorno, Lucca, Massa-Carrara, Pisa, Pistoia, Prato and Siena. This region is known for its wines (most famous of which are Chianti, Morellino di Scansano and Brunello di Montalcino) and has 120 protected regions (nature reserves). Other agricultural products include Chianina cattle (particularly the famous "Fiorentina" steak) and the production of olive oil, principally in Lucca and the surrounding hills. The industry comprises factories producing Piaggio cars, motorcycles, scooters and aeroplanes, the texile industrial district of Prato, the petrochemical plants of Leghorn and the steel factories of Piombino. Tourism is the economic backbone of the so-called 'Cities of Art' (Florence, Lucca, Pisa, Siena, San Gimignano), as well as on the coast and in the isles (Elba). Marble is quarried in Versilia (Massa and Carrara), Garfagnana and in the Alpi Apuane. Florence never ceases to amaze. In the words of Stendhal, it is a city "of subtle charm" that is not depleted by the importance of the most well-known greatnesses. Pisa lies in the place where once there was the mouth of the river Arno; today the sea is more far away, but the city has always maintained a particular fascination. The Hills of Chianti are a zone of Tuscany between the province of Florence, Siena and Arezzo.